A carte-de-visite portrait of Lord Edward Pelham-Clinton (1836-1907), GCVO 1901, KCB 1896, DI, Groom-in-Waiting to King Edward VII, 1901. Born London, 11 August 1836, second son of the 5th Duke of Newcastle and Lady Susan Hamilton Douglas, daughter of 10th Duke of Hamilton. In 1865 he married Matilda (d. 1892), daughter of Sir William Cradock-Hartopp, 3rd Bart. Educ. : Eton. Ensign Rifle Brigade, 1854; in Crimea after the fall of Sebastopol; Captain, 1857; in Canada 1861-1865; Lieut-Col, 1878; retired 1880; in India 1880; MP (L) for North Notts. 1865-1868; Sherwood Rangers Yeomanry Cavalry, 1865-1868; commanded London Rifle Volunteer Brigade, 1881-1890; Groom-in-Waiting to Queen Victoria, 1881-1894; Master of Queen Victoria's Household, 1894-1901; GC Saxe-Ernestine Order, 1897; GC Crown of Prussia, 1901. Address: 81 Eccleston Square, SW; The Heights, Witley, Surrey. Clubs: Army and Navy, Wellington. 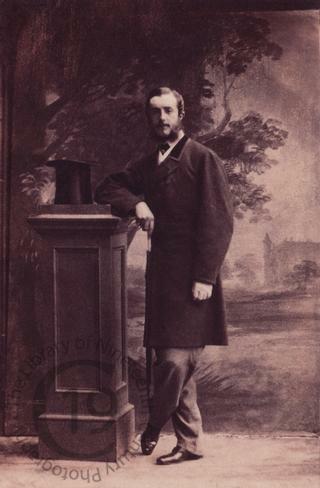 Lord Edward Clinton died on 9 July 1907. His younger brother, the third son of the Duke of Newcastle, was Arthur Pelham-Clinton, popularly called Lord Arthur Clinton, who was involved in the notorious Boulton and Park scandal. Ernest Boulton and Frederick Park were cross-dressers who were arrested leaving the Strand theatre on 28 April 1870. Ernest Boulton, known to his friends as 'Stella' or 'Lady Stella Clinton', was the long-term partner of Lord Arthur, and had even had cards printed with the name 'Lady Arthur Clinton.' The subsequent trial of Boulton and Park for 'conspiracy to commit buggery' caused a media sensation. Lord Arthur Clinton died a few of days after his name was published. The official report stated that he died from exhaustion brought on by scarlet fever, but it is clear that he probably committed suicide. Photographed by Camille Silvy of London in 1860.